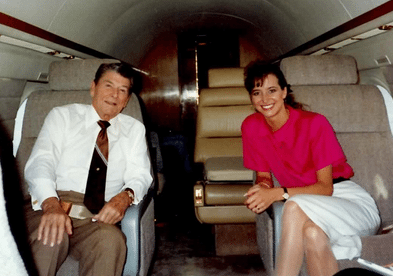 President Ronald Reagan chose Peggy Grande to work at his side for 10 years, and together they created a powerful partnership. Serving as his post-presidency Executive Assistant, Peggy was the liaison between Ronald Reagan personally and his staff, the public, local dignitaries and world leaders. She ensured that his events, travel, personal and political relationships and day to day operations were handled efficiently and effectively. She had a front row seat to history and got to know Ronald Reagan the man, not just the president. The President Will See You Now is an affectionate and intimate memoir about Ronald Reagan, based on Peggy’s decade working for him after he left the White House. From the viewpoint of an insider, she shares, behind-the-scene stories, humorous moments, and poignant insights into one of America’s most beloved presidents. ​Starting in the Office of Ronald Regan as a college student and quickly earning her way into a coveted rolse as the president’s Executive Assistant, Peggy offers an unparalleled perspective on the post-presidency of a political icon, revealing a unique, private side to a public figure and world leader. She shows how Ronald Reagan remained true to core beliefs, gentlemanly kindness, and undying hope for his country to the very end. Dorchester is only 33 days away!